This is an article from our archives that was previously run on another site in June, 2007. While staying in Catalonia for a few days, we set out from Figueres to make a day trip to Cadaqués. Due to misunderstanding of roundabout, we ended up on the isolated northern beaches of Roses, but managed to eventually twist and turn our way back to the right road. This delay ended up being incredibly lucky as it had us driving over the top of a hill in Cap de Creus where the vineyards of Mas Perafita are located. We entered the winery at the exact right time to visit while they were having their grand release day for their very first wines: Perafita 2005, Cadac 2004, Moscatell 2006, and Garnatxa 2006. The Perafita and Cadac were both reds. Perafita was the lighter of the two, even though it had an alcohol content at 14.5%. You could really taste the Merlot and Garnatxa in the blend as the Cabernet Sauvignon seemed to be propping those two up more than the other way round. It also had strong oak flavors to it that came through very well. The Cadac was much deeper and approached a more standard California alcohol level of 15% in an area where most wines are around 12%. 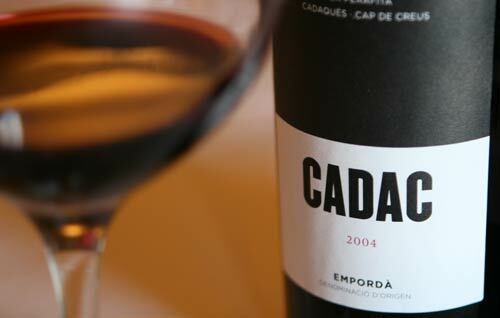 It had already aged well, despite coming from rather new vines that were planted in 2001. Given another year in the bottle, it will most likely develop an even deeper body to it that will carry the 64% Cabernet Sauvignon of the wine very, very well. It will be interesting to see how the Garnatxa that makes up the rest of the wine will blend with the Cab over time and if the spicy perfume in the nose will increase or fade. The most interesting element to these two reds is that it seemed like you could taste the sea in them. This would seem obvious given that you can see the Costa Brava from their hills and it took several tastes to really believe that this was true. But, according to the owner’s son, Rafael Martín Faixó, we were not the first people to notice this. In addition to these reds, we also tasted their two delicious sweet wines: Moscatell and Garnatxa. Both of these were very good, very deep and flavorful. The Moscatell was the stand out of these two with wonderful fresh fruit flavors that swirled around the palate and had a great, smooth finish. Despite being inadvertent party crashers to the wine release event, we were treated very well and saw that this was indeed a happy family-run business with Rafa, Carme, and their three children: Ester, Georgina, and Rafael all taking part in the event and very happy to talk passionately about their wines at great length. We found this ironic given that the winery originally started as a hobby to provide wines for their well-known restaurants in Cadaqués, Can Rafa and Casa Anita. Over the years, this has eventually grown to the size it is today and located in a grand house that was first mentioned in historical documents in 1387. We were just happy in our driving mistake which led us to the premiere of these outstanding wines and yes, we did eventually find our way to Cadaqués.